Fanelli, G., Fanelli, M. Brunelleschi's Cupola Past and Present of an Architectural Masterpiece. 2004 Mandragora. On vacation in South Florida for Christmas, I finally had the chance to catch up on some reading that I’ve intended since my trip to Europe two years ago. While in Florence, Italy, I picked up a comprehensive volume about the design and construction of the cupola of Santa Maria del Fiore, often known as the ‘Duomo’, which simply means cathedral. 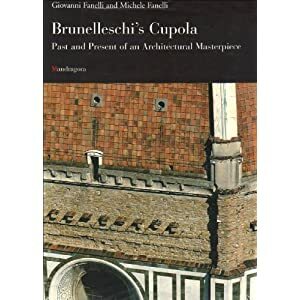 The Book, Brunelleschi’s Cupola (Fanelli, 2004), provides a factual account of the structure based on historic documents and modern computer analysis. Despite sticking to verifiable information, the story of the cupola and its architect is both unbelievable and inspirational. By the early 14th century the city state of Florence had established itself as a political and economic leader in the region. Local authorities wanted a cathedral to physically manifest their superiority, a political aspiration that has never really gone out of vogue. As work proceeded on the cathedral, in 1357, the decision was cast to construct the largest dome since the Roman era. 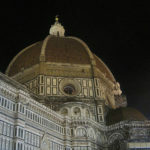 However, it would be another 63 years before construction began on the cupola of Santa Maria del Fiore. The feat would require innovation in organization, design, construction equipment, and the services of a new profession: the architect. Although the city elders may have counted on divine intervention to deliver the solutions to their building challenge, they were much assisted by a well-organized team leading the construction. The cathedral project was led by the city’s top guilds – something like a mix between the chamber of commerce and labor unions. The guilds for merchants, bankers, physicians & apothecaries, silk producers, and wool producers formed a sort of board-of-directors, known as the Opera di Santa Maria del Fiore, to guide the project. In time, the very powerful wool guild came to take the majority of responsibility. 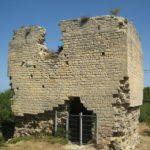 The Opera kept detailed records of building material purchases and contracts. They also sought to work with professionals and frequently called on experts to offer confidence that the construction would be undertaken successfully. By the early 1400s, the cathedral was ready to receive its iconic dome, but no one as yet had provided a solution for the extraordinary span or the means of construction. At that time, Filippo Brunelleschi (1371-1446) was already consulting on the project. 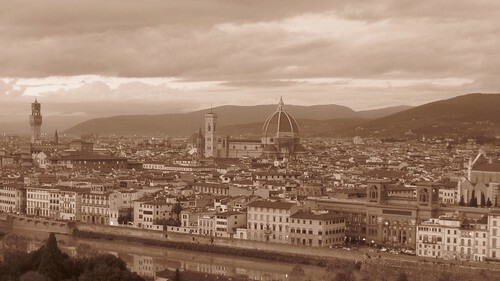 He had gained some fame completing projects like the Hospital of the Innocents and the Barbadori Chapel before bringing his talents to the Opera di Santa Maria del Fiore. Legend has it that Brunelleschi arrived at the Opera and boldly declared that he had a solution for constructing the cupola without centering, interior scaffolding to support the structure until it was fully erected. It’s said that he refused to describe his plan, insisting that someone would steal the idea and get the contract instead of him. To prove his point, he challenged the Opera to balance a boiled egg on end. After many failed, he simply cracked the end and stood the egg, saying see how easy it is when you know the answer. No winner was declared in the 1417 design competition, but additional information was requested from Brunelleschi and Lorenzo Ghiberti (1378 – 1455) three years later. Although Brunelleschi’s design met the design objectives, the Opera still was still wary of Brunelleschi being able to deliver as promised. Brunelleschi, Ghiberti, and Battista d’Antonio were jointly awarded the contract for the position of provisor operis Cupole construendi. This new position was superior to the traditional role of master builder (capomaestro). In time, Brunelleschi would edge out his peers and become recognized as the singular architect of the Cupola. Stay tuned for further discussion of the design and construction of Brunelleschi’s Cupola in forthcoming blogs. Have you visited the Duomo of Florence? 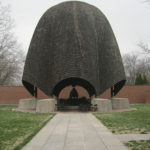 What was your impression of the structure? Please contribute your comments below. Its been a while since we both shared some time at U of M (ASCE Student Chapter). I still remember the time we all went to Madison for the Steel Bridge Competition. How are things going in Chicago? It seems like writing is your passion so why not go with it further and try and make a career out of it?. I also remember you were telling us once, how you were considering Law at one point or another?. Is that still in your mind? We studied all the major works by Brunelleschi & others when I was taking a course in the History of Architecture. The Renaissance age had great builders and designers. Efram, nice to hear from you. I do enjoy writing and have been considering doing more of it. Engineering does pay the bills though. After working on some large litigation projects where my company was serving as expert witness, I have been cured of any desire to go into law. I’d much rather be creative and productive rather than assign blame when things go wrong. One could argue though, that creativity is required in almost any type of profession one pursues. However, Art, Architecture, Engineering & any sort of other creative design, probably lead the way and have far reaching influences on people’s lives and on society in general.